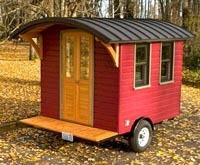 Portland Alternative Dwellings has a wonderful set of gypsy caravan plans. 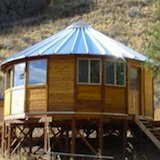 They are a tiny house construction company based in Portland, Oregon who focus on creating small earth friendly dwellings. 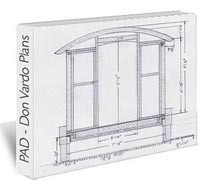 Their Don Vardo is a mobile dwelling that can be a great way to extend your home, use as an office, reading space, writing studio, music room, or tiny guest house. 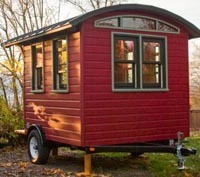 To learn more about the history of the gypsy wagon enjoy the videos provided below. Afterward we'll get right back to the vardo plans! 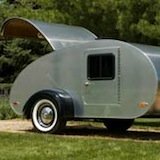 This gypsy caravan is built on a powder-coated 7 by 10 foot trailer with brakes and lights. 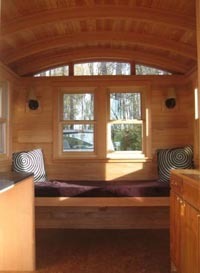 It's fully insulated with heated floors. It meets and exceeds International Building Code and is road tested. 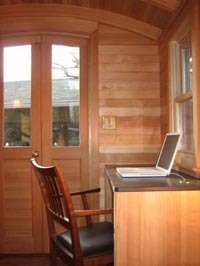 It has cedar siding on top of a rain shield to control moisture. 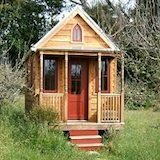 On the inside there's cork flooring, a desk with earth friendly paperstone top, a tiny kitchen cabinet with sink, and a couch with a pull out bed. There are two electrical outlets (it plugs in just like an RV) with a 30 amp electric box. Of course you can customize as much or as little as you like when building it yourself. The plans are 22 pages with written information, photos, and illustrations. It starts with the building basics where you'll learn about structural stability, resources, and a glossary. 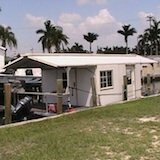 The foundation design and construction is explained thoroughly -- including trailer and wood floor frame. The plans continue with wall and roof details. How to use tie-downs, shear panels, rafters, and stud walls. They also include information on moisture control, utilities, rain-screen walls, and the finish work. All of this for just $175 $30 Learn more about gypsy caravan plans, view pictures, and order by clicking here.